Experts from the Barcelona Macula Foundation publish a revealing article which assesses the main risks associated with this treatment. In collaboration with an extensive group of pan-European specialists, ophthalmologists from the Barcelona Macula Foundation have performed an innovative study which analyses the procedure of intravitreal injection in order to identify the steps which entail a greater risk when undertaking the treatment. The results of the study have been applied by the “Intravitreal Expert Group (IVEG)”, a prestigious international working group, so as to formulate and draw up practical recommendations which it is hoped will greatly reduce the risk of adverse events and improve the results of the procedure. Dr. Monés says that: “the IVEG has highlighted the specific measures which require specific care, such as the preparation of surgical material and equipment, sterilisation of needles, the technique for the administration of intravitreal injections and the quality of the information and instructions provided to the patient”. The study has indicated that the preparation of surgical material has been associated with some of the causes of error with the most risks. Six of the 10 causes of error with the highest probability of risk (Risk Priority Number) are related to sterilisation. Specifically, the cause of error with the highest Risk Priority Number in the report by the researchers of the Barcelona Macula Foundation is related to the sterilisation of the surgical needle. Information provided to the patient when he or she is being discharged and personnel training are other areas with room for improvement. From the analysis carried out by the research team, “practical recommendations have been created which are aimed at resolving and avoiding the causes of error associated with intravitreal injections, many of which are already addressed in national guidelines but applied in an erratic manner”, Dr. Monés explained. For experts, one of the main problems is the scant coherence in national guidelines, which often lack information or contradict other guides. “It is essential to introduce consistency in the recommendations for carrying out this procedure. 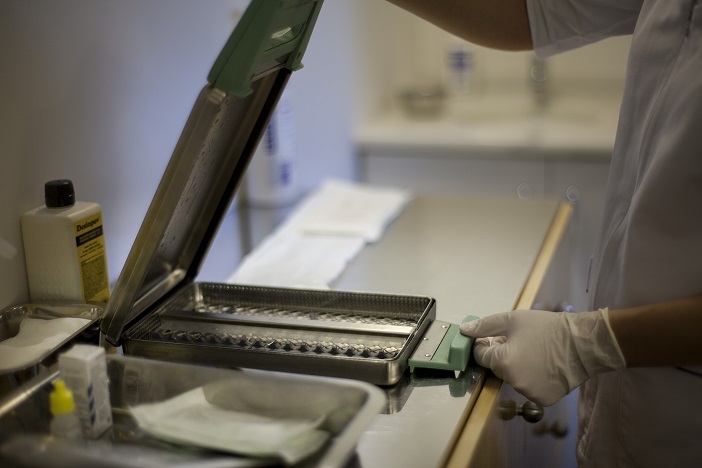 The lack of guidance associated with the proper preparation of surgical material is particularly dangerous and therefore it is imperative to broaden the guidelines in this area in particular. This is the only way to minimise the risks associated with intravitreal injection”, Dr. Monés concluded. The pan-European group recommends that the methodology practiced for creating this analysis should be repeated in the different centres of treatment in order to draw up more uniform guidelines and thereby improve patient care.